Renfro Interiors | Erin Renfro | Doug Renfro | Interior Designer | Interior Decorator | Furniture | Lighting | Bedroom Furniture | Dining Room Furniture | Sofas | Draperies -Construction / Remodel Design Services | Renfro Interiors Inc.
Here’s a few reasons why it’s worth it to hire Renfro Interiors as designer for your custom home project. For many homeowners starting or finding time to start a new project is just overwhelming and often put on the back burner. Erin Renfro is an Interior Designer with Renfro’s Interiors Inc. Knoxville TN. She work with the top professionals in the business whether its new home construction/remodel interior spaces, architectural details, selecting and specifying materials and finishes, kitchen and bath design, and more. She prides herself in the ability to work side-by-side with you and your architect, builder, and contractors in a professional friendly way. If you are interested in meeting with a designer to discuss your next home decorating project, please feel free to visit her Furniture Store and design headquarters in Franklin Square Knoxville Tennessee or call (865) 692-8422. When designing your dream home, you have the opportunity to choose every detail from kitchen counters to shower heads and tile and even your favorite paint colors. After making so many big decisions some people feel overwhelmed and never consider the accents and furnishings. Your Interior designer from Renfro Interiors can make sure every part of the home is as luxurious as you wish. Their experience can help narrow the choices down to match your style! 2. Help focus on the big picture: when building a dream home, many clients get bogged down in details. Our staff has the ability to keep you focused and bring your dream to life. 3. A Trained eye: with years of experience we have helped hundreds of other customers design their dream home. This has given us experience in creating every kind of living space imaginable, from modern to traditional farmhouse. 4. A Complete Package: If building your dream home you expect it to look unbelievable when completed. We can work with the builder to make sure the paint colors will flow with your furniture and overall design choices work together to give you the home your dreaming of! 5. Budget : With our experience we can help you choose which areas of your home will give you the biggest impact for your investment. 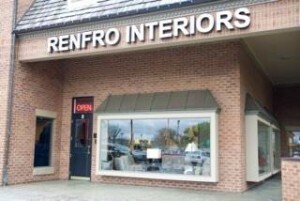 At Renfro Interiors we have the experience in everything from exterior design, to interior decoration of your dream home. Let us help you create your dream space! We are here to help our clients from beginning to end, and our job is not complete until our customers are 100% satisfied. Visit our huge showroom for ideas on furniture, window treatments, accessories, lighting and more! Renfro Interiors Inc. has something for your Home Improvement Projects whether your building a new custom home or remolding an existing space.